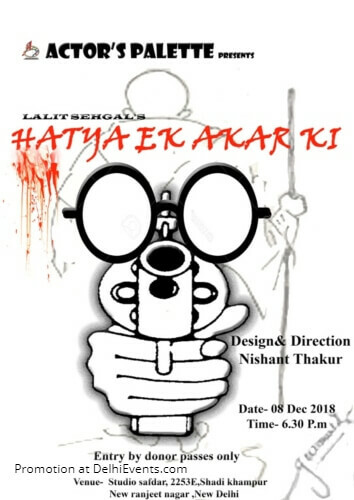 Event Description : THEATRE : Actors Palette presents "Hatya Ek Akar Ki" Hindi Play. The play is about Mahatma Gandhi who has been portrayed in the theater which explores how the Father of the nation sacrificed his life for his principles like Truth, Non-violence, Vegetarianism, Brahmacharya, Simplicity and Faith. The theme of the play is about Mahatma Gandhi's Philosophy, Experimental Beliefs and his Theories & actions.